With the relentless annual approach of Christmas there are of course the inevitable releases of seasonally-themed online slots and this is Microgaming’s early offering. It’s called Happy Holidays and while that title could presumably be referring to any vacation period, the cheesy symbols on show here suggest that Christmas is the subject matter here. 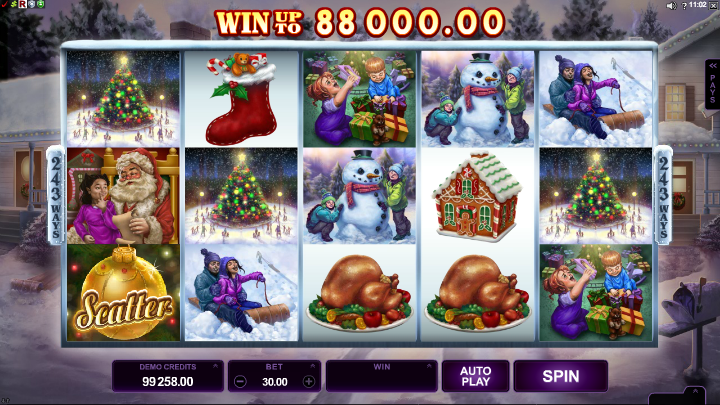 Happy Holidays is a five reel slot with three rows and 243 ways to win; there are no standard paylines – you will win as long as you land matching symbols in adjacent reels starting from the left hand side. Behind the snow-covered reels there are some snow-covered houses to complete what is a very traditional festive scene. All the symbols are related to the theme and include Father Christmas, two kids opening gifts, a snowman, a sledge, a Christmas tree, a stocking, a turkey, a gingerbread house and a plate of biscuits. The Happy Holidays logo is wild and will replace all other symbols except for the gold bauble – that’s the scatter which activates the main feature. This is triggered by landing three or more of the gold bauble scatter symbols and you will be rewarded with 10 free spins. There are four rows of symbol in play now meaning that there are 1024 paylines during this round. Additionally the snowman becomes a type of extra wild, substituting for the four most valuable symbols. It’s not possible to trigger any more spins from within this round. The Frosty Feature is randomly activated from within the base game with no triggering symbols or wins necessary. You get one spin during which the each of the five highest value symbols will pay a bonus amount. Landing just one gold bauble will trigger the free spins round. Happy Holidays is the most traditional of Christmas slots and perhaps that’s why it looks slightly dated; however it’s well worth a pop with two nice bonus features and some festive music.